The blogging world is so amazing. I love all of those little connections. And, when I feel like I'm in a little slump, it's always nice to visit so many fun and creative blogs to get the wheels of inspiration going again. The apron wrap is so pretty. Sounds like the perfect place for it to spend its days! What a wonderful story. You are lucky to have each other in 'blogland'. Looks great tif! What a lucky lady Gloria is, having a friend like you to say such kind things and to make such beautiful things for her. 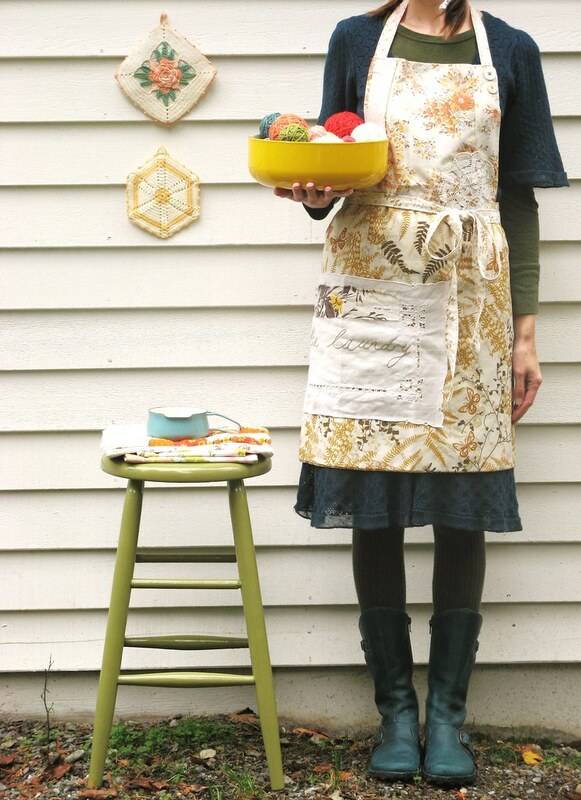 I would like to say how I am admiring the Full Apron Wrap - I think it is SUPER LOVELY. Gloria is a lucky lady and will no doubt be dancing with excitement at the prospect of wearing your lovely creation! PS How IS Used Dog these days - not seen a word nor pic of late or have I missed them? Little Olive is truely cute, but I am hoping Used Dog is OK too. lovely blog! Just found you through a meandering path thru flickr. Your apron made me squeal--I have that same Vera Neumann pillowcase and love it even more now that I see what you've done with it. thanks! oh, i ADORE the full apron and can't wait to take a longer peek at THE LAUNDRY.... looks delightful! used dog is still by my side, along with little olive... they have become the best of friends and make for a very amusing sight when 'out and about' on their walks together. if used dog takes a drink from the water bowl, then so must little olive. if used dog goes on the walk, then so will little olive. if used dog is feeling tired, then little olive will not go walking, no amount of encouragement. she just doesn't do anything unless the 'okay' is given by used dog. I think it's wonderful how we share each others' Up and Downs and Goods and Bads. So much perspective and love we'd miss without the Internet!! When I began reading your post I felt sad that your pal had gone back home, then I got on to all that about me and I came close to tears. You are so sweet, and just so everyone knows, I am beside myself with excitement waiting for my amazing apron to arrive. The moral of the tale is obvious - commission someone you admire greatly to make something for you. I'm constantly amazed too at the generosity and kindness of bloggers. The full apron is a stunner.